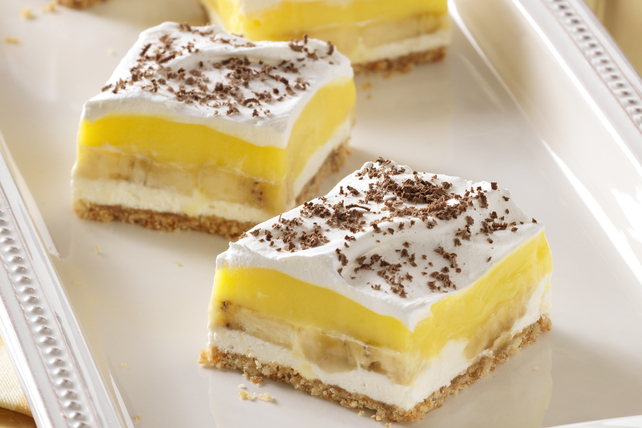 A favourite homey pudding dessert gets updated with a fresh banana cream flavour twist! Combine wafer crumbs and margarine; press onto bottom of 13x9-inch dish. Refrigerate until ready to use. Mix cream cheese spread and sugar in medium bowl until blended. Stir in 1-1/2 cups Cool Whip; spread carefully over crust. Cut bananas crosswise in half, then cut each piece lengthwise in half. Arrange over cream cheese mixture. Beat pudding mixes and milk with whisk 2 min. ; pour over bananas. Cover with remaining Cool Whip; sprinkle with chocolate. Refrigerate 3 hours. Line dish with foil before using, with ends of foil extending over sides of dish. Prepare recipe and refrigerate as directed. Use foil handles to lift dessert from dish before cutting to serve. We've made over this favourite dessert to save you 100 calories and 9g of total fat, including 5g of saturated fat, per serving by preparing the crust with non-hydrogenated margarine and crushed vanilla wafers instead of with flour, butter and pecans. In addition, we reduced the sugar, and used skim milk and other better-for-you products. We even added bananas for more flavour. Substitute 1 cup graham crumbs for the crushed vanilla wafers. Since this great-tasting dessert is made with better-for-you products, it can fit into your overall healthy eating plan.